Cash versus food, four experiments in four countries http://t.co/IHjvVtitFC If @cblatts quotes it, it must be true! 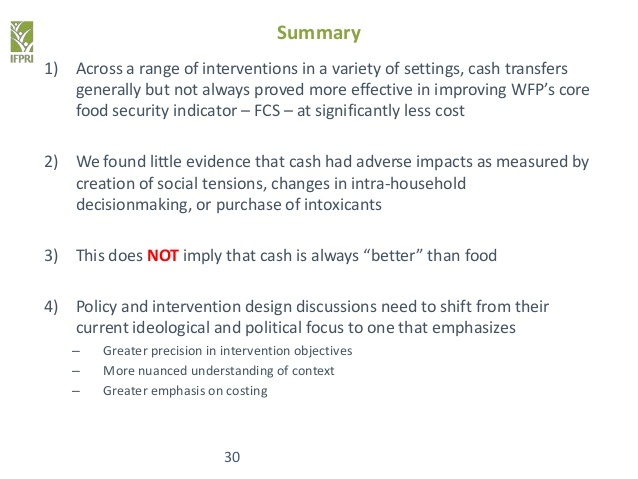 Did they measure any increase or decrease of dependency relative to the cash aid or food aid. But maybe the beneficiaries of both types of aid were not farmers. Also if food could be bought locally with the cash aid it does suggest that food was grown locally or at least somewhere nearby. This brings the thought as to why some received the aid when, typically unless it is a humanitarian disaster, others would have been selling food surplus. This is a typical scenario. Food surplus producers are selling their food surplus to people who receive cash aid in the very same community. Some are genuine cases in need but some are on dependency. There is a stat somewhere that shows that 80 per cent of the food grown by small holders is grown by 20 per cent of the small holders. So 80 per cent of the small holders grow 20 per cent of the food. This is all in the same communities with the same rain, soil, etc. It is a point not addressed and harmful to agricultural production, personal and national prosperity. I feel the budgets on food aid should be diverted to food production except in a few cases. The issue then of whether it rains in the USA or Canada would not be so important.